The bond we share with our pets can be a uniquely therapeutic thing: animals are important to our wellbeing. Animals bring us so much more than companionship, they can provide comfort and sense of steadiness, especially when things seem hectic. With Animal Assisted Therapy (AAT), it’s our aim to bring that sense of comfort into our practice. Building relationships with animals expands the same strengths needed to build relationships with other people. When working with Dr. Gene Devers, clients at Philly Family Life Counseling, LLC may opt to include Wyatt, our Golden Retriever. Why Opt for Animal Assisted Therapy? The benefits of support animals in therapy are numerous and researchers continue to find positive effects in Animal Assisted Therapy studies. The presence of animals raises our spirits, encourages a sense of comfort, supports a calming effect, and promotes rapport in the therapeutic relationship. 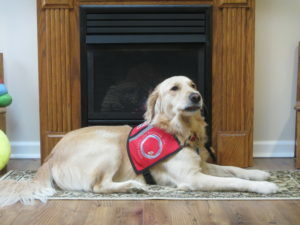 Counseling is most effective when the client is comfortable, and a dog can help achieve that. Prior to or during a session, interacting with a dog can encourage the brain to reduce stress hormones and induce a feeling of being calm and in control. Animal Assisted Therapy can help to generally improve relaxation, self-confidence, trust, relationship building, and other struggles we encounter daily. Simply interacting with Wyatt in a therapeutic setting can lighten the mood and lead to smiling and laughter. Thus, providing an atmosphere of encouragement and hope. Dr. Gene Devers’ goal for working with Wyatt and providing Animal Assisted Therapy is to create an environment with an effective sense of security, engagement, and warmth. Wyatt’s presence and personality will encourage, reassure, and function as a responsive emotional pillow for clients who are open to having him participate during counseling sessions. To meet Wyatt, and experience the benefits of AAT, please reach out to schedule an appointment with Wyatt and Dr. Devers.